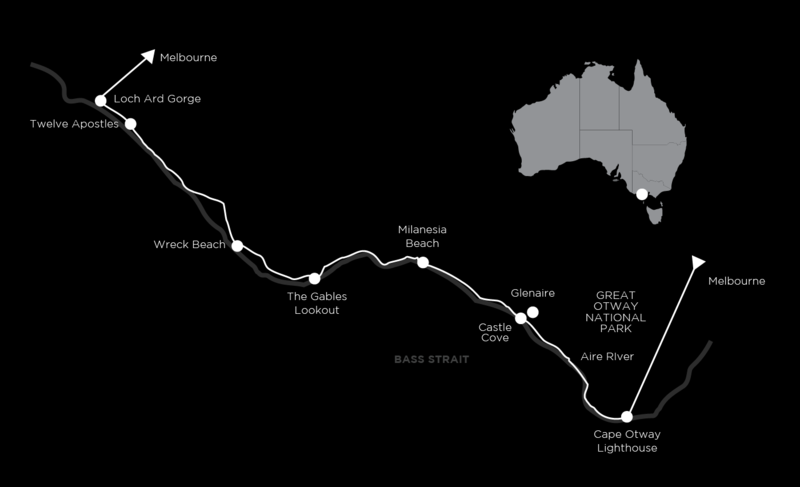 We’ve condensed the highlights of the Great Ocean Walk to take in all of the best walking on this iconic track. Breathtaking coastal scenery, magnificent forests, abundant wildlife and sheer diversity of landscape, this walk bears the mantle of being one of Australia’s most spectacular walks. The highlights include stunning views as you progress along the track at Castle Cove and the Gables, then at the Wreck and Station Beaches. Prepare to be humbled by the sheer enormity of the limestone cliffs and the sea stacks. Imagine thunderous surf, pristine beach and getting right up close to two of the offshore sea stacks, Gog and Magog. The walk shows off the diversity of the region, traversing inland and coastal forest with an abundance of native fauna. The trek ends at the Twelve Apostles, but not before taking a walk down Gibson’s Steps, a stunning perspective of the Apostles which not too many walkers get to experience. Staying at the lighthouse earns you the right to enjoy these amazing grounds exclusively, maintaining a sense of splendid isolation both on and off the track. A pair of expert guides will lead the way, providing the flexibility to walk at a pace that suits you and with the opportunity to shorten the walking if preferred. We will depart Melbourne at 7.15 -7.30am to embark on the Great Ocean Walk travelling on the world famous Great Ocean Road. Starting at Bells Beach, stopping at Lorne on the way. The walk begins from Blanket Bay hiking to Parker Inlet along cliff tops and through coastal forest. It’s here where we will meet our shipwreck historian to listen to the many stories about the hundreds of shipwrecks that have occurred along this coast. If the time permits we will walk to the lighthouse via Crayfish Bay. This lighthouse has been in operation continuously longer than any other lighthouse in Australia. Today’s walk is from Cape Otway Lighthouse via Station Beach and Castle Cove to Johanna Beach. There will be an optional short return hike to pretty Rainbow Falls where a spring cascades down to the rocky coastal platforms below. The track continues through the wind-sculpted sand dunes and along the cliff tops to the Aire River estuary and wetlands. We opt to start the afternoons walk from Castle Cove where the views back to the lighthouse are some of the best on the walk, trekking across more cliff tops all the way to Johanna voted as one of the best beaches in Australia. We start this morning with a walk guided by an indigenous historian. We then walk down to Milanesia Beach, one of those secret beaches not many people get to. From here, the track continues along the cliff tops, with views all the way back to Cape Otway Lighthouse. Time permitting we continue to Moonlight Head and a visit to the Gables. The Gables Lookout is perched on one of the highest seacliffs in mainland Australia. This is a superb spot for whale watching between June and September. The high seacliffs, breathtaking views, coastal forests and native fauna all work in concert to make this one of the most worthwhile days of walking you’ll find anywhere in Australia. Today we continue through a grove of casuarinas to Wreck Beach where the remains of two shipwrecks can be inspected. We pass Devils Kitchen on our way to Princetown and the wetlands of Gellibrand River. Our last walk finishes at the Twelve Apostles but not before a walk down Gibson’s steps and views of Gog and Magog, two of the 12 Apostles right up close. Afterwards, we drive back to Melbourne stopping for dinner arriving around 8:30pm. Most walks range from 17–20km on well formed and well graded tracks with a few short beach sections. Whilst the walking is mainly easy to moderate, there are a few hills making it tiring at some points. We stay at the historic lighthouse keepers’ cottages at Cape Otway. Please note that there are shared bathrooms and no single rooms on these two nights. However the payoff is that we get to enjoy the lighthouse and its surrounds virtually to ourselves. The last night is spent at Port Campbell in a motel in private rooms with ensuites. Healthy and delicious chef-prepared restaurant food will be provided for breakfast, lunch and dinner, on day 3 and 4. When we are at the lighthouse our expert guides cook up a feast ensuring that you’re well looked after. A walkers lunch may include a high protein type salad, a roll or a wrap, a muesli bar, cake or muffin of some kind and a piece of fruit. We’ll lunch at beautiful locations on the track and each day is slightly different. Lunch is always augmented by Auswalk’s famous trail mix. The trip starts and finishes in Melbourne. Most walks range from 17-20 km on well formed and well graded tracks with a few short beach sections. Whilst the walking is mainly easy to moderate, there are a few hills making it tiring in some places. However, Auswalk operates with multiple guides offering easier and harder walk options along the way. This trip is suitable at anytime in the year, but we depart at the very best time being autumn and spring. See the Bureau of Meteorology’s information about temperatures and rainfall ahead of time to ensure proper clothing.